Dry eye is the most common ocular condition affecting patients. Our cornea specialists, Dr. Murray Friedberg, Dr. Robert Sambursky and Dr. Jeffrey Davis, are committed to the proper diagnosis and effective treatment of this chronic disease. Ocular irritation is one of the earliest symptoms a patient with dry eye may experience. Classically, the patient describes a sandy, gritty, foreign-body sensation that often becomes more pronounced as the day progresses. Other common symptoms include tearing, fluctuating vision especially after reading or using the computer, pressure sensation, and eye fatigue. Some patients may note a more severe “burning” sensation in the eye when exposed to particularly dry or irritating environments such as dry heat, warm or smoke-filled rooms, and wind. Sensitivity to light may also be reported. Dry eye is quite complex and is caused by a multitude of conditions and the treatment must be customized to each patient. The tear film is a complex liquid that has multiple components. Each component must be present in the proper amount to allow for a proper tear film. Many medical conditions and even some medications can cause a disturbance to the tear film and its components resulting in dry eye. Dry eye treatment must be customized to the patient. “Cookbook” methods of treatment should be avoided. 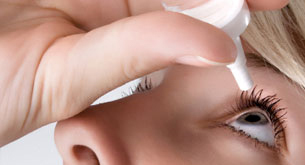 Treatment is centered towards both replacing the tear volume allowing the eye surface to be properly “moisturized”, while also helping the patients eye to create the tear film components properly. About 50% of patients with dry eye will develop chronic inflammation. Those patients with inflammation benefit from long term anti-inflammatory treatments. In-office tests are now available to confirm the presence of inflammation and help to guide therapeutic decisions. Some treatments utilized alone or in combination include: artificial tear drops, prescription anti-inflammatory medications, dietary supplements, lid hygiene and punctal plugs.